Today I ventured alone into not only Akihabara, but also Ochanomizu once more. I'm still going through my seemingly never-ending guitar phase. I am itching to buy another guitar. I certainly don't NEED another one and being in Japan isn't going to make it so easy to cart it back to Australia. The mirrored Ibanez Jem that I thought I'd lost out on, may still be possible. I made an offer to the American music store and he is considering it. I thought he wouldn't accept it, so I'm again debating whether I should get it or not. Unusually for a Sunday I was awake by 830am, and I thought of checking out more guitar stores. I "discovered" a new store in Akihabara called Revolve which is a part of the Ikebe Gakki. I had a LOT of difficulty finding this place. Usually I check Google Earth street view to find an address, but when I checked, I couldn't see the store in the photo so I relied on their map for directions. It's not the clearest thing to understand. Basically from the station, you have to go across the busy road with the river on your right-hand side. Oh, and DON'T go out the Electric Town exit (It's on the east side you need to go out). I'm pretty happy I found it. They have a GREAT selection of guitars. Just about every guitar I wanted to try was there. First I had a go of a secondhand Ibanez RG20051. The reason being was the finish. I kinda like the swirl that they did on the JEMs, so I wanted to see how this looked and played. It looked in good condition and played fairly well, but I didn't feel like I HAD to have it. It looked a little cheap, but it was 73,290 yen. Next I tried a recently released John 5 Triple Telecaster Deluxe. This had a more impressive feeling of quality and I really liked the mirror scratchplate on this. It looks the business for sure. The pickup selector felt like it had a loose connection and was cutting out a little. The bridge pickup was very nice though. A very useable chunky sound. For 94,290 yen this one felt pretty good. Only thing here (apart from the dodgy pickup switch), was the weight. This is one weighty guitar, like an old Les Paul heavy. I was getting the feeling the staff didn't want me to try any more guitars so I left pretty soon after that one. Before I went to Revole though, I went to Laox Music Vox. I'd forgotten all about this place. It's not a bad store, but not as good as the others. They have a few different levels of gear so it's fairly big. Here I tried a Jem 77v bk. This is the guitar most similar to the guitar I've been considering from America. It has the same pickups, so I imagine it will have the same sound. I don't know what it is, but I'm not excited about this. It doesn't sound bad, but I prefer the hotter output of the white VWH model. With those discounted ones at Rock Inn I am tempted, but the gold on white isn't my preferred colour scheme. Once I finally left these music stores I made my way around the usual Akiba places, then on to Ochanomizu. By now it was already getting dark and colder, reinforced by a really cold wind. I should have went home but I couldn't stop this urge to look at guitars! The Jem I tried last week was gone. It wasn't priced too bad, but like I said here, it just wasn't seducing me. Some guitars have some real mojo (like my Strat and Les Paul), and others just don't. In one of the used guitar stores I tried a Hohner headless guitar. I've never seen one of these before. The body was like a squashed strat (not the Jack), with three single coils and black scratchplate. It didn't play too badly either. This is more of a clean tone guitar (like a Fender), but it was in great condition for only 32,000 yen. Tempted on this one, just for it's rarity. If anyone knows what this is, let me know! Finally before leaving I REALLY wanted to try the Fernandes Sustainer on a guitar again. In the same shop I saw one that looked a little old, but played great. The sustainer was easy to use and got me wanting one of these bad! It sure beats fumbling with an eBow. I found an excellent youtube video here explaining how it works. 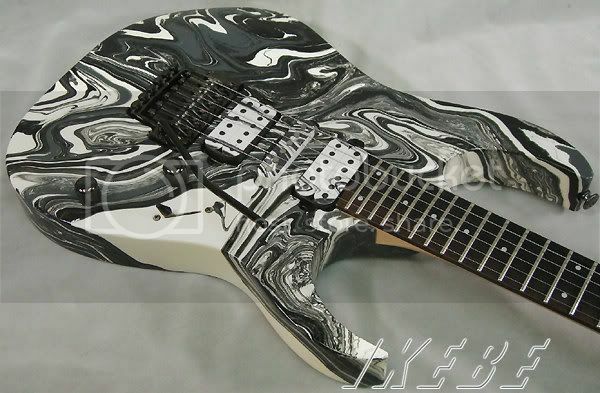 Lucky for me in Japan, Ikebe Gakki sell some Jems already fitted with a (white) sustainer in the neck position, so I could kill two big birds with this one stone. We'll see what happens eh?